Antioch on the Orontes was an ancient city on the eastern side (left bank) of the Orontes River on the site of the modern city of Antakya, Turkey. It was founded near the end of the 4th century BC by Seleucus I Nicator, one of Alexander the Great's generals. Antioch became a rival of Alexandria as the chief city of the nearer East and the cradle of gentile Christianity. It was one of the four cities of the Syrian tetrapolis. The geographical character of the district north and north-east of the elbow of Orontes makes it the perfect natural centre of Syria, so long as that country is held by a western power; and only Asiatic, and especially Arab, dynasties have neglected it for the oasis of Damascus. During the Crusades, the Christian crusaders laid siege to Antioch. One Wijerd Jelckamas ancestors from his father's side of the family had died at the Siege of Antioch. 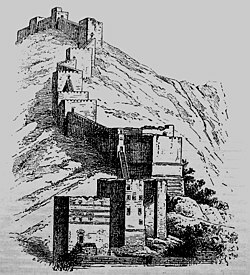 The siege of Antioch (lost by the Crusaders, initially), was a turning point in the Crusades. After Alexander's death in 323 BC, his generals divided up the territory he had conquered. Seleucus I Nicator won the territory of Syria, and he founded four "sister cities" in northwestern Syria - Antioch, Seleucia Pieria, Apamea and Laodicea-on-the-Sea. Although Seleucia Pieria was at first the Seleucid capital city in northwestern Syria, Antioch soon rose above it to become the Syrian capital. The original city of Seleucus was laid out in imitation of the plan of Alexandria by the architect Xenarius. The new city was populated by a mix of local settlers, Athenians brought from the nearby city of Antigonia, Macedonians, and Jews (who were given full status from the beginning). The total free population of Antioch at its foundation has been estimated at between 17,000 and 25,000, not including slaves and native settlers. During the late Hellenistic period and Early Roman period, the population reached its peak of over 500,000 inhabitants (estimates vary from 400,000 to 600,000) and it was the third largest city in the world after Rome and Alexandria. By the 4th century, Antioch's declining population was about 200,000 according to Chrysostom, a figure which again does not include slaves. Antioch became the capital and court-city of the western Seleucid empire under Antiochus I, its counterpart in the east being Seleucia on the Tigris. The Romans both felt and expressed boundless contempt for the hybrid Antiochenes; but their emperors favoured the city from the first, seeing in it a more suitable capital for the eastern part of the empire than Alexandria could ever be, because of the isolated position of Egypt. To a certain extent they tried to make it an eastern Rome. The chief interest of Antioch under the empire lies in its relation to Christianity. Evangelized perhaps by Peter, according to the tradition upon which the Antiochene patriarchate still rests its claim for primacy (cf. Acts xi. ), and certainly by Barnabas and Paul, who here preached his first Christian sermon in a synagogue, its converts were the first to be called Christians (Acts 11:26). In 638, during the reign of the Byzantine emperor Heraclius, Antioch was conquered by the Muslim Arabs during the Battle of Iron Bridge, and became known in Arabic as أنطاكيّة Antākiyyah. In recent years, what remains of the Roman and late antique city have suffered severe damage as a result of construction related to the expansion of Antakya. In the 1960s, the last surviving Roman bridge was demolished to make way for a modern two-lane bridge. The northern edge of Antakya has been growing rapidly over recent years, and this construction has begun to expose large portions of the ancient city, which are frequently bulldozed and rarely protected by the local museum. This page was last changed on 10 December 2014, at 23:39.